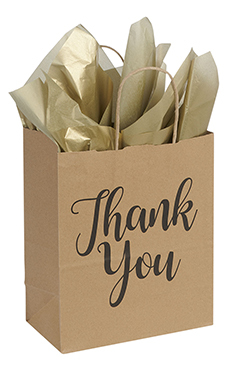 The Medium Kraft Thank You Paper Shopping Bags are perfect for your customers or next event! These bags are great for a wide variety of merchandise. They measure 8”L x 4¾”D x 10¼”H (Cub) and feature 70# paper weight, providing durability and convenience as well as handles and a gusset. Sold in cases of 100.